This festival was originally commemorated on the Vigil of Ember Saturday in Lent. With the decline of liturgical understanding a special festival was instituted in its honor in order to arouse popular devotion to this mystery. It is now the patronal feast of the Lateran Basilica, and of all churches under the title of St. Savior. There is also a commemoration of Pope Saint Sixtus, Saints Felicissimus and Agapitus, Martyrs. Pope St. Sixtus II, 24th Successor of St. Peter, effected the translation of the mortal remains of the man Christ chose as the first Sovereign Pontiff of His Church. Sixtus also introduced the Latin exclamation Deo gratias into the Ordinary of the holy Mass. He is also referred to as Xystus and is mentioned in the Canon of the Mass. He served in a basilica in Rome, which is called Saint Peter ad Vincula (in chains) was the first martyr actually put to death in the catacombs themselves. Under the Emperor Valerian (258) he was beheaded on his throne just as he finished Mass. His four deacons were put to death with him, and two others, Felicissimus and Agapitus, were decapitated the same day while St. Lawrence, the archdeacon, was put to death three days later. O God, Who in the glorious transfiguration of Thine only-begotten Son didst strengthen the sacraments of faith by the testimony of the fathers, and Who didst wonderfully foreshow the perfect adoption of Thy children by a voice coming down in a shining cloud, mercifully grant that we be made co-heirs of the King of glory Himself, and grant us to be sharers in that very glory. Through our Lord Jesus Christ, Thy Son, Who liveth and reigneth with Thee in the unity of the Holy Ghost, God, Forever and ever. O God, Who dost permit us to celebrate the birthday of Thy holy martyrs, Sixtus, Felicissimus, and Agapitus grant us to enjoy their companionship in everlasting beatitude. Through our Lord Jesus Christ, Thy Son, Who liveth and reigneth with Thee in the unity of the Holy Ghost, God, Forever and ever. Lesson from the Epistle of blessed Peter the Apostle. Dearly beloved, We have not followed cunningly devised fables, when we made known to you the power and presence of Our Lord Jesus Christ; but having been made eyewitnesses of His majesty. For He received from God the Father honor and glory: this voice coming down to Him from the excellent glory, This is My beloved Son in Whom I am well pleased, hear ye Him. And this voice we heard brought from Heaven, when we were with Him in the holy mount. And we have the more firm prophetical word, whereunto you do well to attend, as to a light that shineth in a dark place, until the day dawn, and the day-star arise in your hearts..
Thou art beautiful above the sons of men: grace is poured abroad in Thy lips. V. My heart hath uttered a good word. I speak my works to the King. Alleluia, alleluia. V. (Wis. 7: 26) He is the brightness of eternal light, the unspotted mirror, and the image of His goodness. Alleluia. Glory and wealth are in His house: and His justice remaineth forever and ever. Alleluia. Sanctify, we beseech Thee, O Lord, the gifts offered on the glorious transfiguration of Thine only-begotten Son, and by the splendors of that very illumination cleanse us from the stains of our sins. Through our Lord Jesus Christ Thy Son our Lord, Who liveth and reigneth with Thee in the unity of the Holy Ghost, one God Forever and ever. We offer Thee, O Lord, the gifts of our devotion; may they be rendered both pleasing unto Thee, for the honor of Thy just ones, and to us, through Thy mercy, helpful to salvation. Through our Lord Jesus Christ, Thy Son, Who liveth and reigneth with Thee in the unity of the Holy Ghost, one God Forever and ever. Tell the vision you have seen to no man, till the Son of man be risen from the dead. 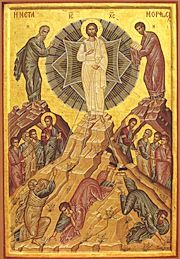 Grant, we beseech Thee, O almighty God, that with the understanding of a purified mind we may follow those sacred mysteries of Thy Son’s transfiguration which we celebrate with our solemn office. Through the Lord Jesus Christ, Thy Son, Who liveth and reigneth with Thee in the unity of the Holy Ghost, one God For ever and ever. Grant us, we beseech Thee; O Lord, by the intercession of Thy holy martyrs, Sixtus, Felicissimus, and Agapitus, that what we touch with our lips we may receive with a pure heart. Through the same Lord Jesus Christ, Thy Son, Who liveth and reigneth with Thee in the unity of the Holy Ghost, one God, For ever and ever.